Arizona public school district M&O and capital overrides were approved at much higher rates this year than in recent years. “There’s clearly a heightened sensitivity in the state to the needs of education. That combined with an economy, which is a lot better than it was in 2009 and 2010, are why you’re seeing some voter empathy for school districts,” said Randie Stein, a director in the public finance department at Stifel Nicolaus in Phoenix. This year, 20 percent of Arizona’s 223 public school districts had bond or override measures on the ballot as a result of declining state funding that has made it difficult for districts to maintain class sizes, increase teacher salaries and upgrade technology to meet state testing needs. Voter approval of Proposition 123 in May increased per-pupil funding, from $3,426.74 to $3,600, but many school districts still lack adequate funding for building maintenance and student transportation as recent news articles suggest. Ballots were still being counted several days after the election, and that also has been a trend in recent years, according to a report on the November 2016 election from Stifel Nicolaus. In past years, late ballots tended to support school district elections and, in some cases, changed the outcome reported on election night. Although the results reported below are not final and a canvass of votes has not been completed yet, Stifel Nicolaus believes these election outcomes will not change. 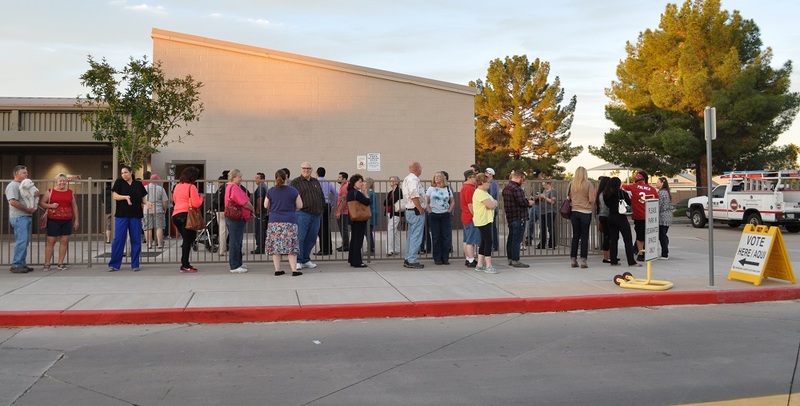 Colorado River Union High School District in Mohave County is one of the districts waiting for all ballots to be counted. On Monday, the district’s bond election was ahead by 70 votes after being down by a similar margin earlier, said Lance Ross, director of public and community relations for Colorado River Schools. “What’s interesting is that all four Mohave County school measures lost on election night, and were winning 72 hours later. The wait-and-see is as tough as the campaign,” Ross said. On Tuesday, Stifel Nicolaus projected that election, which would authorize the issuance of $35 million in bonds for improvements at the two high schools, construction of an athletic arena, and a career and technical education center, will be approved by voters. 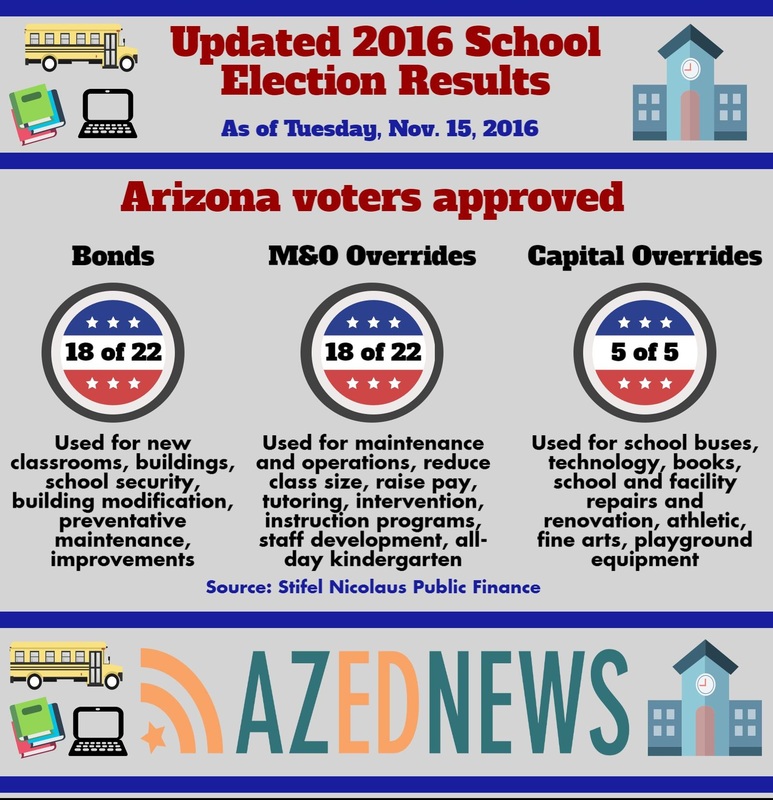 Fifty-five school district questions were presented to Arizona voters this election. Four dealt with the sale of school property, two asked for authorization to participate in a Joint Technical Education District, and voters approved all of these. The remaining 49 questions were bonds and overrides. Arizona voters approved 82 percent of the 22 M&O overrides on this year’s ballot, significantly higher than the 68 percent passage rate from 2003 to 2015, Stein said. The capital override approval rate of 100 percent this year showed the greatest change, up considerably from passage rates that have ranged from 22 percent to 40 percent since 1999, Stein said. Voters approved 82 percent of the 22 school bond elections on the ballot this year, below the 89 percent passage rate for from 1999 to 2015, Stein said, noting that the only two years with a higher number of bond questions were 2005 with 28 and 2006 with 27. “In general, there weren’t a lot of surprises for the elections,” said Paul Ulan, managing partner with Primary Consultants, LLC in Phoenix. Ulan said the election outcomes backed up his survey results and the Morrison Institute survey that showed 74 percent of voters want to invest more money in public schools. Many people thought that the outcome of Prop. 123 might hurt school districts with bond and overrides up for election in November, “but from everything I saw and heard, it didn’t factor at all,” Ulan said. Prop. 123 was approved by voters in May to settle the inflation funding lawsuit. 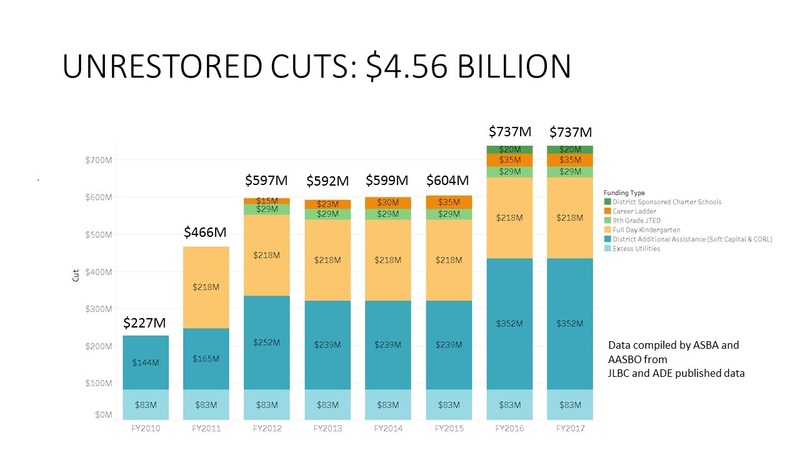 However, it did not restore $4.56 billion in cuts made since the 2009-2010 school year, according to data released earlier this month by Arizona School Boards Association and Arizona Association of School Business Officials. 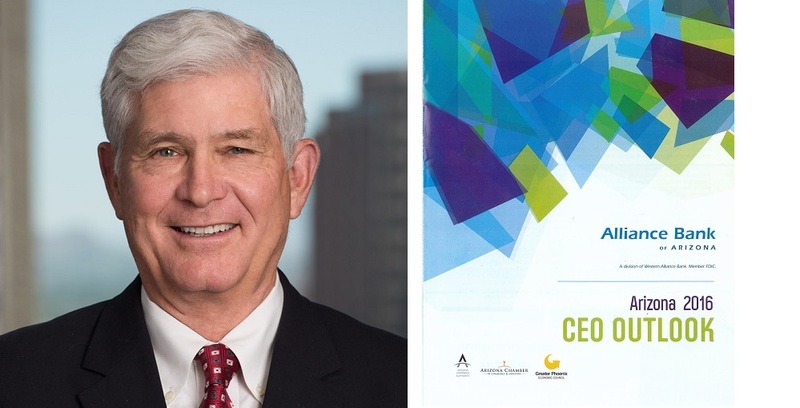 Data compiled by Arizona School Boards Association and Arizona Association of Business Officials from Joint Legislative Budget Committee and Arizona Department of Education published data. This election “showed that if you do your homework, put together a reasonable ask, and you have a strong effort to go out and pass it, you can be successful,” Ulan said. For example, voters approved Sierra Vista Unified School District’s $28.8 million bond – the first school bond in that community in 25 years – after the district determined what was needed and a community group supporting it advocated for the measure, Ulan said. In the past two years, Arizona voters have approved about $2 billion in school district bonds and overrides, with $900 million in 2015 and $1.1 billion in 2016, Stein said. Ulan said he wasn’t sure what was behind the significantly higher passage rate for capital overrides in the past two years. “I don’t know if that is more sophistication from a campaign standpoint, more understanding from the voters standpoint or the fact that the committees are now able to communicate they’ve cut our capital by 85 percent or a combination of all three,” Ulan said. A capital override can raise funds for a school district up to 10 percent of a district’s revenue control limit. All the capital overrides mentioned the need for new technology and that might be something that voters value, Stein said. Other common threads were facility and safety upgrades. “What’s led up to this is cuts in district additional assistance through the school finance formula,” Stein said. District additional assistance is state funding for soft capital items like textbooks, curriculum, technology, school buses and some capital. 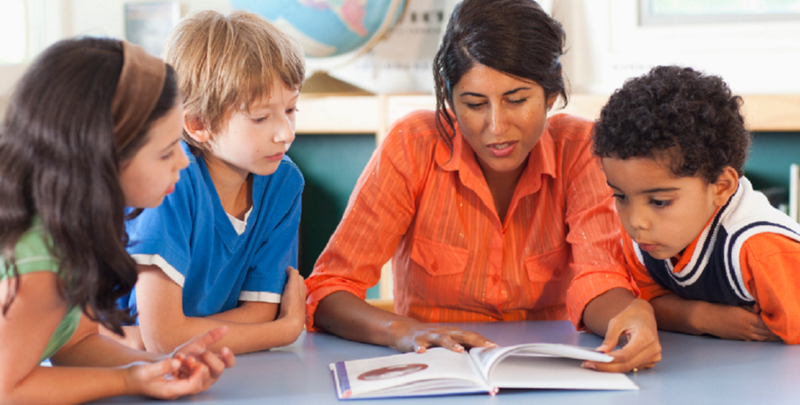 From 2009 to 2016, a portion of district additional assistance funding was suspended by the state making it harder for schools to provide up to date materials, curriculum and technology for students, according to the Arizona Education Association. Another factor is the change in the building renewal program through the Arizona School Facilities Board, Stein said. When the program was originally implemented it was supposed to be an automatic distribution to all school districts that would have provided up to $250 million a year, but then the Arizona Legislature changed it to a building renewal grant program providing about $60 million a year to schools that apply with current needs, Stein said. For several years, the Arizona legislature stopped funding the state’s building renewal fund and used those funds to ease the budget deficit. There has been just over $2 billion in cuts by the Legislature to capital funding for school districts since 2008, according to Chuck Essigs, director of governmental relations for Arizona Association of School Business Officials. “I don’t think you can ignore the fact that a lot of what has happened at the state level is what’s led to school districts having such a large capital need,” Stein said. This year’s ballot had the lowest number of M&O overrides since 2003, and they passed at the highest rate since 2005, Stein said, noting that from 2012 to 2015, voters approved more than 80 M&O overrides. Laveen Elementary School District’s seven-year 15 percent M&O override of a little more than $3.9 million was approved by Arizona voters this year. Johnson said he believes voters realize that overrides are needed to provide programs that the state doesn’t fund like full-day kindergarten, counseling for students and music, art, and P.E. at all grade levels. Voters re-authorized Marana Unified School District’s 10 percent override that was previously approved by voters in 2007 and 2011. 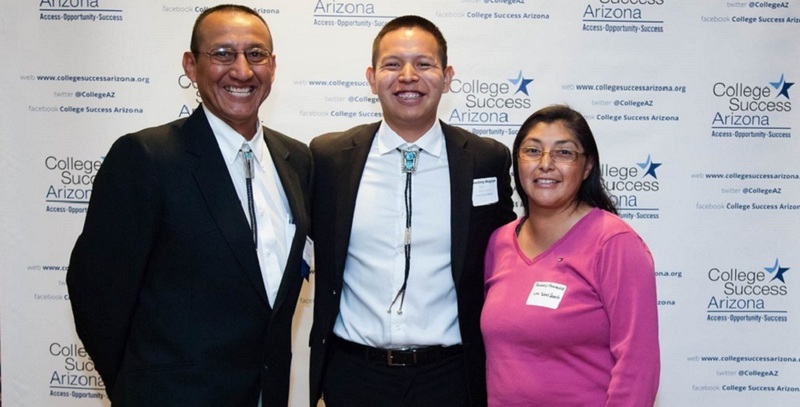 “Through the approval of the override, our district will continue to provide a diverse educational experience to ensure our students are prepared with the skills they need to be successful in the 21st century,” said Dr. Doug Wilson, superintendent of the Pima County district that serves more than 12,400 students. The approval of the override prevented the district from having to make $6.7 million in budget cuts, ensured critical classroom support and programs continues and retained high-quality teachers and staff, Wilson said.